A Force Behavior (beForce) is a Behavior which can be used to apply an impulse or a constant force to an Entity. To use a Force Behavior, the physics mode of the bones should have been switched to Dynamic Rigid Body with a Physicalize Behavior. A Force Behavior defines the following specific attributes. For common attributes see Behavior Common Attributes. Impulse: when a Force Behavior starts (and only when it starts, not continously), an impulse can be applied to the Entity. Note that it is possible to use all these directions together, the final computed direction being the sum of them. 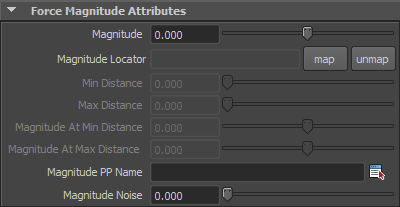 Magnitude Noise Amount of random to be added to the computed force. amount of random to be added to the computed force. E.g with a Magnitude set to 1 and Magnitude Noise set to 2, the computed magnitude value will be in the [-1 ; 1 ] range. Note that it is possible to use all magnitude modes and noise together, the final computed magnitude being the sum of them. Those parameters can be used to change the force applied on each bone. 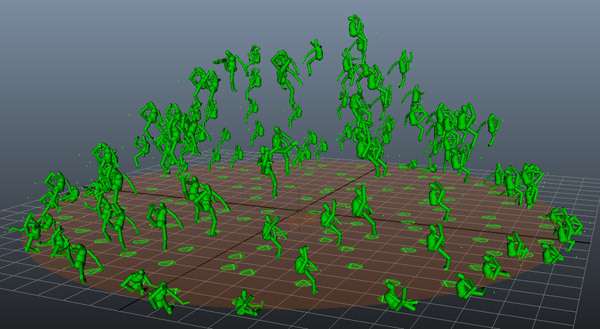 By default, the physics simulation will be computed on the entire body (meaning all joints for which physicalized have been checked when exporting the Character file, see Body Physics Properties). However these physicalized joints list can be filtered by the body mask to compute physics simulation only on specified channels. if checked, physics simulation is activated on the Entity Pelvis. Spines List of the spines affected by the behavior. You may specify any spine name as seen in the Motion Mapping Panel of the Character Maker. Star ( * ) wildcard is authorized at begin or/and end of names (i.e. spine*, *spine, etc.). Separate the channels names by coma ( , ), leading and trailing spaces will be ignored. Use the * wild card to use all limbs. Names are NOT case sentitive (compared as lowercase). Limb Channels List of the limbs channels to play on the entity. Use the button to open a window with the name of all the available Limbs for the Character Files loaded in the scene. Those names can also be found in the Motion Mapping Panel of the Character Maker. Star ( * ) wildcard is authorized at the beginning or/and end of names (i.e. left*, *arm, etc.). Separate the channel names by comma ( , ), leading and trailing spaces will be ignored. Names are NOT case sensitive (compared as lowercase). List of the effectors ​channels to play on the entity. Use the button to open a window with the name of all the available Effectors for the Character Files loaded in the scene. Those names can also be found in the Motion Mapping Panel of the Character Maker. Use the * wild card to use all effectors. If an effector channel is selected, the corresponding limb channel is automatically added also. The Force Behavior provides a way to display the Min Distance and Max Distance from the Magnitude Locator. Enable or disable the magnitude. See capture below. 3d Magnitude Enable or disable the 3d Magnitude. See Capture below.